Well, this week may not be about the word count or the revision pages, but it's turning out to be pretty busy anyway. Anyway. *taking a deep breath* I'm so excited about getting that done. I've just printed it up, and now it's a matter of assigning the time to write each story. Cool! Not much is going on around here this week. It's going a little fast because I'm continually doing stuff, thinking about something, or working out. Well, I think I'm going to read a little now... Bye! As you can see, my TBReviewed pile is getting smaller. 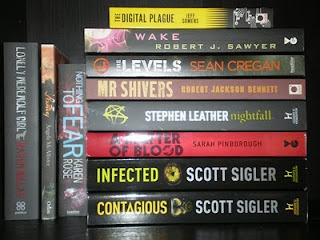 But don't let this picture fool you, because I received another four books last week. lol. Looks like I'll be taking a new photo this week. I've got a series plan to take care of this week, a list to make for any last-minute alterations that need to be made for my NaNoWriMo novel + Alyce#4, a few novellas to read, and I'd like to put a few promo things together for CARELESS, too. It doesn't sound like much, but when you get down to it, it is. Which is fine with me. Of course, other things might pop up too, and this small list doesn't count real life stuff either. Okay, it's time to get on with the writing week. See ya! As you can see, I've updated my TBReviewed pic. That's because I'm making some good reading progress. 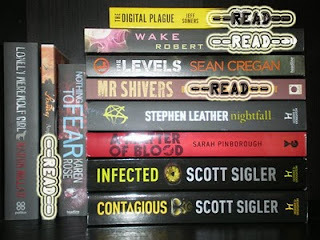 Yesterday I finished reading NIGHTFALL by Stephen Leather, which was outstanding. I love, love, loved it. Seriously. I can't say it enough. 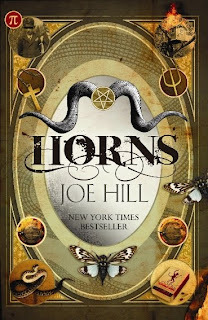 This afternoon I started reading HORNS by Joe Hill. This is my first JH book. I've actually got his other two books on my horror shelf (not for review, I bought them myself) but haven't gotten around to reading them yet. Looks like this one's a good place to start. Love the cover. Although, I did read and enjoyed LOCKE & KEY: Welcome To Lovecraft, last year. I've got some awesome news to share today. I'm very excited to announce that over the weekend, I signed a contract with Eternal Press. It's for a book called, SHADE OF GREY, which is the first installment in a trilogy I'm calling Omega. It's a romantic Sci-Fi story set in Australia, with some alien-type stuff involved. ;) I've filled out and returned all of my forms now, and can't wait to share more info as I get it. But for now: Yay! Well, this week's off to a cool start. I got a bunch of things off my to-do list already. The other main thing I'd like to tackle this week is the second draft revision for one of my shorter novellas. It's only 65 pages (double spaced) so I'm hoping that I'll be able to get through it without too many probs. :) I've been thinking a lot about some upcoming tales that I'd like to weave, and will need to adjust my goals to fit everything in. Which is cool. And before I go... I got a fantastic review for WITHER the other day. It got a 5 Lips rating from TwoLips Reviews. Thanks Merrylee! Here's a little of what she said: "What at first seems to be an odd blend of story genres works so well, Wither is perhaps the best category-length science fiction romance I’ve ever read. It reminded me a lot of Firefly, with a little bit of High Noon and The Howling mixed in for a solid, enjoyable read." As you can tell, I'm pretty excited today! 'You're going to hell, Jack Nightingale': They are words that ended his career as a police negotiator. Now Jack's a struggling private detective - and the chilling words come back to haunt him. Nightingale's life is turned upside down the day that he inherits a mansion with a priceless library; it comes from a man who claims to be his father, and it comes with a warning. That Nightingale's soul was sold at birth and a devil will come to claim it on his thirty-third birthday - just three weeks away. Jack doesn't believe in Hell, probably doesn't believe in Heaven either. But when people close to him start to die horribly, he is led to the inescapable conclusion that real evil may be at work. And that if he doesn't find a way out he'll be damned in hell for eternity. 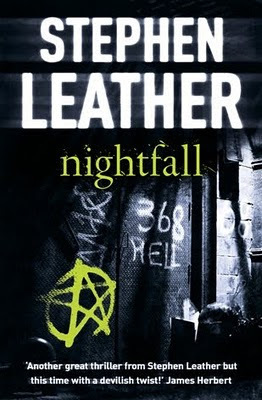 Before reading Nightfall, I'd heard of Stephen Leather but hadn't read any of his books. I'm glad that this was my first one, because I really enjoyed it. Jack Nightingale--I love that name!--is a negotiator, and when the book opens we get a taste of what his job entails. He's on his way to meet with a possible jumper. But this isn't your average potential suicide. It's a 9-year-old girl called Sophie. The very idea of something so horrible chilled me. And what followed was one of the best and most powerful openings I've ever read. It was so vivid, shocking, and well written that I had tears in my eyes. I couldn't believe how awesome the book was already. I'm very happy to report that it only got better from there. Fast forward two years and Jack is still being haunted by what happened after Sophie's suicide. He can recall confronting the little girl's father but can never quite remember if he pushed him or if the man jumped out the window. But Jack's no longer on the force. He's now a struggling private detective mostly handling cheating partners. He has a small office and a devoted secretary called Jenny. Who happens to come from a rich family and actually cares for Jack in a very platonic way. He smokes too much, drinks even more, and is constantly hearing people say: "You are going to hell, Jack Nightingale." Actually, he starts to hear (and see) it a lot after he inherits a huge rundown mansion from his biological father. He didn't even know he was adopted, but as he starts to unravel the bizarre life of Ainsley Gosling, and discovers a hidden basement filled with strange books, Jack finds out that his father sold his soul to a devil. But Jack doesn't believe in the devil or hell. Still, he finds himself consumed by the possibility. Being chased by death at every corner doesn't help. He's no stranger to losing loved ones, he lost his parents at 19, but now his aunt and uncle die in a murder-suicide, his best friend in a car accident, the birth mother he met only days before kills herself... Jack's having a very bad week. But if his soul does belong to a devil, it's only going to get worse because his 33rd birthday is just around the corner. That's when this devil will collect. This book is brilliant--from the plot, to the characters, to the dark and spooky situations, there's nothing I didn't like about it. I loved every minute of it. The story's addictive, and I loved it when towards the end, Jack finds himself confronted by his worst fear and decides to do what he does best: negotiate. He comes full circle, but leaves the mystery of a possible sister open for future installments. Nightfall is an amazing occult thriller, and had me hooked from the beginning. I couldn't wait to find out what other dark and horrid secret Jack would find next, or how he'd get himself into trouble. This one's another keeper. I can't wait for more Jack. I've actually enjoyed splitting up my road to publication story into seven installments. It's been nostalgic. Oh, and my interview has been posted at Raine Delight's Blog. I've been pretty busy this week, haven't I? lol. I didn't get too much done in the way of actual writing, but it's important to find the balance between the writing stuff and the promo stuff. It's nice to get out and about every now and then. That's it for today. I hope you all have an awesome weekend! On the outskirts of Newport, on the US East Coast, lies an abandoned, feral housing project: the Levels. Inhabited by Newport's forgotten homeless population, the Levels are run as a personal fiefdom by the all-powerful Sorrow. As THE LEVELS opens, ex-CIA agent Nate Turner, who is in the Levels to find out who has just tried to kill him, meets a 14-year-old girl Ghost. Ghost is a Fury, one of Sorrow's trained, drug-addicted assassins looking for a way back to her normal life. Also in the Levels is Kate, a suspended cop, who has been told that she has only days to live after being attacked, and infected, by the Beast, a serial killer working the streets. The Beast is out for revenge on Kate's new employer, who he believes created the infection that's killing him, an infection that has also been released into the Levels. This is the debut urban thriller novel by Sean Cregan. Turner's dead. Well, he's actually still very much alive but someone died in his place and no one rectified the error. It's not surprising in a town where the cops are as dirty as the criminals. He decides to keep to the shadows, to try and figure out what's going on. But someone's following him and he goes to hide out in the Levels. Kate is a suspended cop. Her only real crime was being involved with a dirty cop dealing drugs on the side. When he got caught, she also suffered the consequences. The night she's attacked, a group of men save her. Except, is that what they really did? They're a secretive bunch who want her to work with them, since she apparently ruined their one chance at getting their target. Oh, and they also mention that she's got a deadly virus that'll kill her in several days. So, it's in her best interest to help them find the Beast, which will lead to the cure. Ghost is a teenage girl. Turner finds her sleeping in the dingy apartment he's staying in. But she's no ordinary teen. She's got several secrets and addictions, and desperately wants a way out. Still, Turner teams up with her. She knows the Levels and those who reside there. In a twist of fate, Turner and Ghost also stumble on Kate. And together, the three of them are able to delve into the darkness of the Beast who wants everyone dead because he wants revenge. And also figure out that the group Kate thought she could trust are actually keeping their own secrets. A lot is at stake, and it all leads to an explosive conclusion. 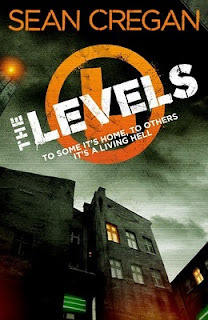 The Levels is a fast-paced, interesting story that is woven by switching from what's going on with Turner, and Kate. It keeps the story fresh and unfolding at a pretty quick pace. The events were unpredictable too. Yet, I don't know why I didn't like it as much as I thought I would. It has tension, secretive vibes, a realistic feel, yet seems alien at the same time. 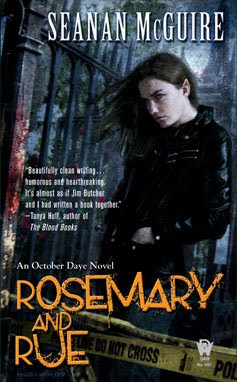 It's gritty and violent, a good story, but... Maybe it's because I found myself a little disconnected from the two main characters and was instantly drawn to Ghost, instead. I'm not sure. Still, it's a good book and I'm glad I read it. Wednesday is here already. Yikes! I say it every week, but where's the time go? Hubby's at work, daughter's back at school, and I've decided to squeeze in a quick blog entry before getting stuck into things. Today my interview has been posted at the BookWenches. I had a great time answering these questions. They were awesome, detailed, and really made me get into the nitty-gritty with my answers. I'm still over at Novelspot's Behind the Scenes. Day 2 has just been posted. I'll be posting an entry every single day, for seven days. It's all about where/when I started to write. It's also about my long and winding road to publication. The false starts, the pausing when real life hit, how writing has always been there in the shadows for me, and how it pretty much will remain. It's strange, digging deep and remembering everything. As for what I'll be working on today... I'm going to do a few things. I want to write my next two BtS posts and work on my Sci-Fi series overview. It'll be good to jump from one to the other, and hopefully make progress on both. <---Last week I posted this picture. 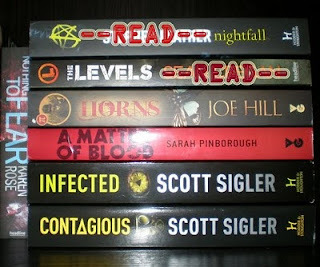 It's my Hachette review pile. Except, I hadn't marked anything on it. Now, I have. :) I thought it would be cool to post it every Monday until I've read every single one of the books on the pile. It's a way to keep tabs on it, as well as motivation to keep going. 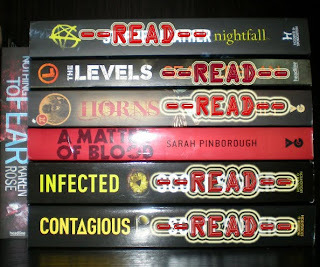 As you can see, I've now crossed off 4 books. Two that I read last week, and two the week before. At the moment I'm reading LEVELS. I started it today. Oh, and I received HORNS last week. So maybe I should update the picture next week. lol. Anyway. The weekend was cool. It went too fast and it rained the whole time, but we still squeezed in a trip to the shops on Saturday, and yesterday we went for a nice long walk, worked out, watched an animated movie, and just hung out. 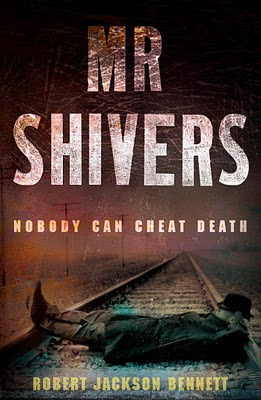 I also finished MR SHIVERS, which was awesome. I really, really enjoyed it. This morning hubby went to work several hours later so he could watch the SuperBowl. It was great spending the day with him, especially since the team he was going for won. Go the Saints! ;) But it also means that I didn't get any work done. Which is fine because I sorta planned for it. I knew he'd be home today, and my daughter will be home tomorrow, so I'm going to tackle smaller things during the first half of the week. Then I want to sit down and plan out one of my series. That should keep me busy for the rest of the week. Then I'm heading into some more revision. A novella this time. So next week's already booked in. And before I go, this week I'll be over at Novelspot's Behind The Scenes. I'll be posting over there all week. So if you'd like to know a little about my road to publication and when the writing bug bit me, you can check it out. I'll hopefully be posting my first entry shortly. That's it for tonight. Catch'a tomorrow! PS. I forgot to mention that I'm also at VampChix today. I'm chatting a little about my love of vampires. And I'm also giving away eBook copies of HEART AND SOUL + VAMPIRE ORACLE: DEATH. 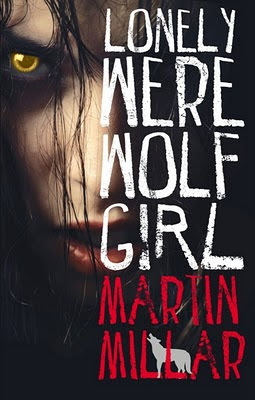 Caitlin Decter is young, pretty, feisty, a mathematics genius - and blind. Still, she can surf the net with the best of them, following its complex paths clearly in her mind. But Caitlin's brain long ago co-opted her primary visual cortex to help her navigate online. So when she receives an implant to restore her sight, instead of seeing reality, the landscape of the World Wide Web explodes into her consciousness, spreading out all around her in a riot of colors and shapes. While exploring this amazing realm, she discovers something - some other - lurking in the background. And it's getting more and more intelligent with each passing day. This is the first book in the WWW trilogy. Caitlin has been blind since birth, and has recently moved to Canada with her parents. She attends a local school and is a whiz at maths. 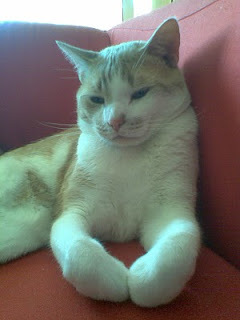 She's also got an uncanny talent for the web. Using some especially designed software, she constantly updates her LiveJournal, leaves book reviews, browses the Internet, uses search enhines, and chats with friends. Being blind hasn't been a hinderance to her life and she's quite independent too. But when she's offered the opportunity to undergo an experimental procedure to get her eyesight back--an implant to her left optic nerve--she's excited and accepts it. In Japan, after the surgery on her left eye, she still can't see but convinces Dr. Kuroda to let her keep the implant until the end of the year. And so, she connects to what she dubs EyePod via the Internet and returns to Canada. The day she starts to see something that she suspects is colour and lines, she contacts Dr. Kuroda and starts to realise that what she's seeing is the web, which leads to seeing the real world. However, her connection to the web helps awaken an artificial-intelligence entity, which is essentially the world wide web. At the same time there are two other stories going on--one about a very clever chimpanzee hybrid, and the other about a Chinese government coverup that blocks China from the rest of the world via the Internet. It's clear that all these stories will eventually connect because they're drawing closer, but that doesn't happen completely in this book. Although I really enjoyed it, I found the technical side of things a little too involved and even distracting. I found myself hoping that the story would return to Caitlin's every day life with her family and friends. I really liked her, even if she did seem a little too mature for a 15 year old. :) Also, the description and experiences Caitlin goes through when she sees and describes things from a blind person's POV is amazing. 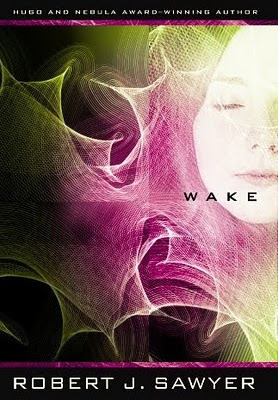 Wake is an interesting story about hope and a miracle that will surely lead Caitlin to some very interesting situations in the books to come.